Stronger Together is a series of dialogue and learning sessions for families and allies impacted by substance use. We will explore systemic barriers to family support, share promising practices, and brainstorm solutions. We will learn from each other’s experiences, successes, and challenges. Community knowledge will be documented and used to inform substance use service planning, as well as research directions, in your community and province. For more information on what the sessions entail, visit www.bccsu.ca/Stronger-Together. 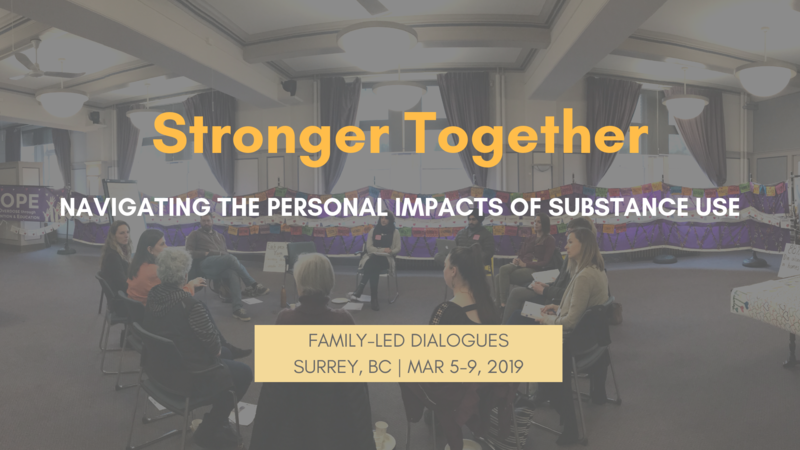 If you live within the Fraser region of British Columbia, and are a family member or ally affected by substance use, you are invited to attend these sessions. Summary reports will be available on the Stronger Together page after the sessions. For additional information, please contact katie.mai@bccsu.ubc.ca.